Comes in a variety of styles, sizes and colors, with our without your custom logo. Protect expensive elevator cabs, frames, adjacent walls and glass doors. Posts & ropes and Tensa Barrier retractable belts systems come in various styles and finishes. Protect your walls and corners from constant abuse with our stylish guards. Dramatically increase traction on your slippery stairs, comes in a variety of patterns and colors. 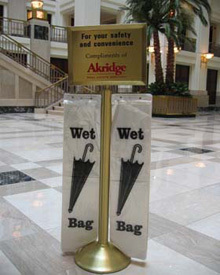 Tenants simply pull off one of the disposable bags and slip in their wet umbrella, keeping your whole lobby safe and dry.